Indoor pollutants have a tendency to build up during the cold months when we seal ourselves in our homes. Breathing these in can result in a host of ill health effects, ranging from allergy aggravation to, in the case of radon and carbon monoxide, death. Though it can’t eradicate these contaminates itself, a good air quality monitor like the Laser Egg 2+—an upgrade of the popular Laser Egg 2—can help you understand what’s in your home’s air, so you can take the appropriate actions to clean it up. Like its predecessor, the Laser Egg 2+ has a sleek bell-shaped design and weighs just over half a pound. It measures about 3.5 inches deep and its circular face is 4 inches in diameter. It houses a 2.4GHz Wi-Fi adapter and a 2200mAh Lithium battery that provides about eight hours of power per charge. A Micro-USB-to-USB cable is included. The Laser Egg 2+ monitors for two common indoor pollutants: particulate matter with a diameter of less than 2.5 micrometers (PM2.5) and the total volatile organic compounds (TVOCs) that are emitted from paints, cleaning products, and even cooking. These are displayed on 2.6-inch full-color LCD, along with the most current indoor temperature, humidity, Air Quality Index (AQI), and a three-day weather forecast. You can cycle through these by pressing a button on top of the device next to the power switch. The Laser Egg 2+ will highlight readings that reach hazardous levels. 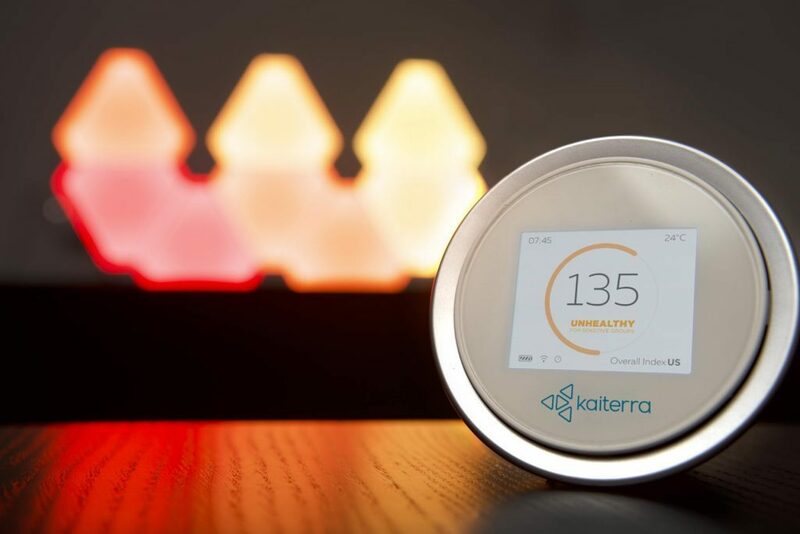 The Kaiterra companion app for Android and iOS allows you to view this same information on your mobile device and also lets you look at historical data over minutes, hours, and days to see how your indoor air quality fluctuates over time. 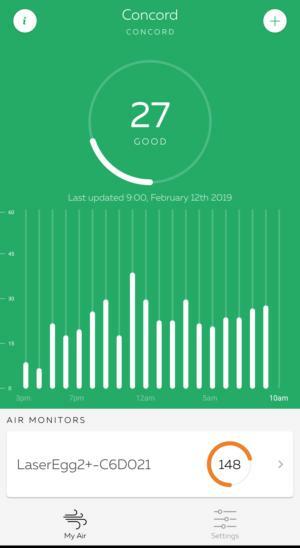 Additionally, the app provides outdoor air quality readings via a local weather station. These reports include readings for AQI, PM2.5, nitrogen dioxide, sulfur dioxide, and ozone, though oddly not temperature or humidity. To start using the Laser Egg 2+, I needed only to plug it in using the USB charger and turn it on. Then I downloaded the Android app, which prompted me to add the device and connect to my Wi-Fi network. Understanding the readings on the device is pretty simple as they generally follow U.S. Environmental Protection Agency standards. AQI is displayed as a numerical value corresponding to one of six color-coded categories representing the current level of health concern—ranging from “good” to “hazardous”—for your locale. PM2.5 is displayed as micrograms per Cubic Meter of Air (μg/m3), and TVOCs are displayed as parts per million. In both these cases, a lower number is better than a higher one. You don’t need to monitor too closely though, as the Laser Egg 2+ will surface any dangerously high reading prominently on its display. The Laser Egg 2+ revealed that TVOCs would spike whenever I used the stove. The Kaiterra app is similarly easy to read. The color-coded AQI score is displayed at the top along with the current indoor temperature and humidity. This section also identifies the current primary indoor pollutant (TVOC or PM2.5). At the bottom of the screen, you can select an individual reading to see how it’s fluctuated over minutes, days, or weeks as displayed on a bar graph. Typically, your first course of action if you get a high pollutant reading is to open your windows. That only works, though, if the air quality outside is better than it is inside. The Kaiterra app takes the guesswork out of this by providing current and historical data for outdoor conditions as well. 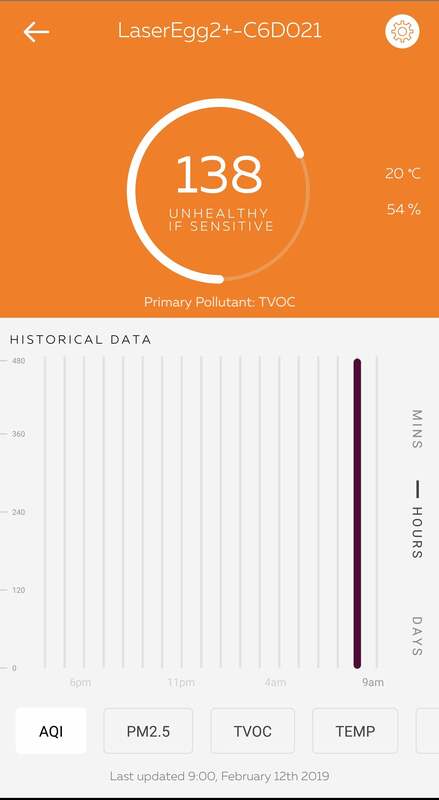 By toggling between the indoor and outdoor data, you can determine how safe it is to ventilate your home with fresh air, and also monitor how external air quality and weather might be contributing to excessive indoor pollutants or humidity. 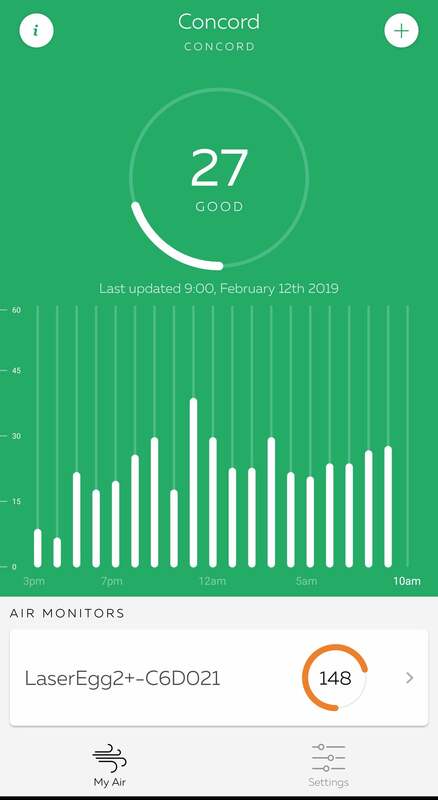 Fortunately, my air quality stayed in the “good” zone during my testing. PM2.5 was my “primary pollutant” for most of that time, though it was consistently at levels that posed minimal risk. The only abnormal readings I got were some spikes in TVOCs that always corresponded to cooking on the stove. After the burners were turned off, those levels would drop to “normal” levels. For now, I’m not concerned, but if it continues it might warrant deeper investigation. The app allows a few customizations: You can select which readings you want displayed by simply toggling them on or off in the settings. You can also choose temperature to be shown in Celsius or Fahrenheit. And, as different countries use different AQI’s, you can choose the one appropriate to your location—though currently only if you live in the US, India, or China. Outdoor air quality data helps you understand indoor conditions. The Laser Egg 2+ is HomeKit enabled and you can set it up by scanning or typing the HomeKit code right in the Kaiterra iOS app and assigning its various sensors to a room. You can use Siri voice commands to check on that room’s air quality, and create automations to respond to changes, such as having your HomeKit-enabled humidifier turn on when the air gets too dry, or have your air purifier switch on when pollutant levels rise. Overall, the Laser Egg 2+ provides most of the air-monitor essentials. It makes it intuitive to understand good and bad readings with simple visual cues. 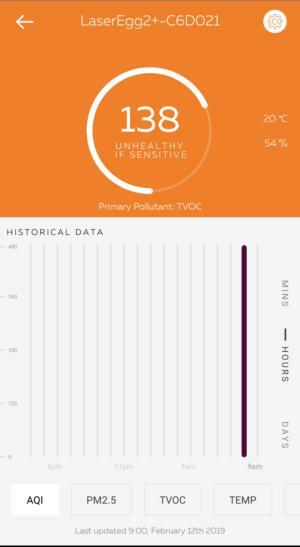 It tracks historical data in multiple visualizations, so you can easily identify air quality trends. And it helps you understand the relationship between indoor and outdoor conditions. Limiting monitoring to just two pollutants seems a little skimpy considering competing products—such as the Airthings Wave Plus and the Awair—track at least three, but that’s a minor quibble given the Laser Egg 2+ more modest price tag. If anyone in your home has health issues that can be impacted by subpar air quality, this product is an easy way to ensure their comfort and peace of mind.